The BR33, one of three new flagships in Bear Archery, passes all the tests. The BR33 is one of three new flagships in Bear Archery’s 2016 lineup. At 330 fps IBO, it’s fast enough for any hunting application. At the same time, with so many bows shooting at 340-350 fps and up (including Bear models like the new 350 fps Escape), the BR33 clearly leans toward the shootability end of the spectrum. The name of the new hybrid cam that drives it — the EAZ Cam — suggests as much, and Bear compares the EAZ Cam to single cams, which are generally known for their smooth drawing and shooting qualities. At a glance, the BR33 has a different look than other Bear offerings. On closer inspection of the test bow, it’s clear that is mostly because the new olive-matte finish with contrasting black limbs, a new grip and a slightly beefier look to the silencers/speed boosters on the stings. Other finishes include Sand and Shadow, as well as Bear’s more traditional Realtree Xtra Green. The geometry of the riser resembles that of recent Bear models, as do the highly adjustable cams, the trademark Max pre-load quad limbs, limb pockets, hinged cable guard, dual string suppressors and rubber riser inserts. Several distinguishing features apart from the new EAZ Cams and the new finish options merit a closer look. These include the new grip, which departs from Bear’s familiar removable rubber grip, the draw-weight range and the draw lengths. The new grip lacks the soft feel of the previous one; at the same time, it’s angled forward more sharply, which for some shooters might tend to promote more of a medium or low wrist grip as opposed to a high grip. The draw-weight range covers 15 instead of the more typical 10-pound range, covering 45-60 or 55-70 pounds. The draw length is the longest of Bear’s current models, running from 27 all the way to 32 full inches — putting this bow in reach of those shooters who shop in the Big and Tall section of men’s clothing stores. This corresponds to a somewhat longer axle-to-axle length of 33.25 inches, which is trumped only by the Arena 34. Fit and finish on the test model were perfect, and the finish, along with logos, easily passed my scratch test. I’ve commented in the past about the ease of setting up Bear bows. Nothing about the riser design precludes the use of any rests or sights I’ve encountered, and achieving proper positioning of the rest is a snap. On the test bow, draw weight was easily adjusted and the limb bolts turned smoothly and easily. The bow came out of the box set at 29 inches. Changing draw length requires no press and no tools other than an Allen wrench, and is easily achieved by simply removing a couple of screws and rotating the module to the proper spot on each cam. Cable stops and limb stops (if you choose to use them) are then simply moved to the corresponding spot. Weight and grip are two things I notice when picking up a bow and drawing it for the first time. At 4 1/5 pounds, the BR33 is neither light nor heavy. It does balance better than most compound bows, though, which contributes to a sense that it is lighter than its actual weight. I’m a fan of the removable rubber grip that has been a hallmark of Bear’s bows in recent years. I find the new grip slightly less comfortable, but I do like the different riser design that tilts the grip forward at a sharper angle. Arrow flight was good after initial setup. I’m a believer in paper tuning, so I took 10 or 15 minutes to get bullet holes through paper with an unfletched arrow. The BR33 is indeed smooth drawing, comfortable and steady at full draw; the cable and limb stops allow the back wall to be as firm as any shooter desires. The bow is quiet at the shot, with a slight amount of vibration. The subjective impression is that it is faster than the numbers indicate. Shooters who like a slightly higher brace height will find it forgiving in that respect. There are bird hunters who would never own an English Setter, or a Brittany Spaniel or a Labrador Retriever — Stick with me here. They’ve got to have a Munsterlunder, a Spanish Water Dog or a Wirehaired Pointing Griffon. There are bowhunters — just scan through any online bowhunting forum — who are disappointed every year when new bows do not exhibit a radically different design, breakthrough technology, unusual materials or hitherto unheard of speeds. They will be disappointed with the BR33 and probably every other new bow on the market. 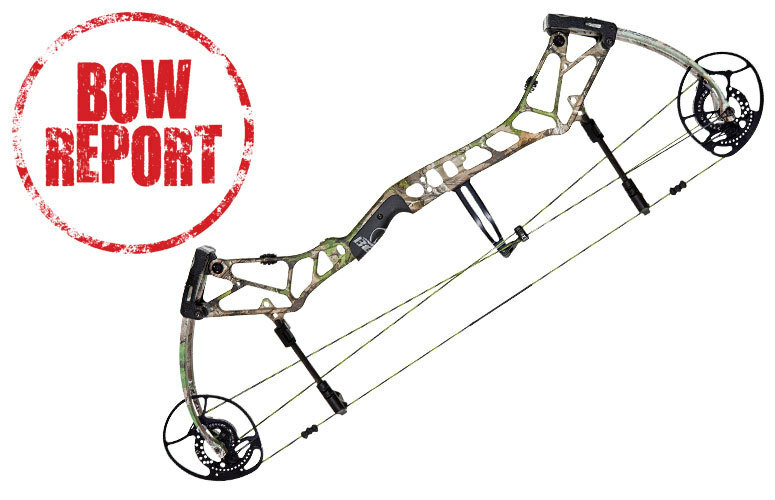 On the other hand, bowhunters looking for a new bow that reflects the state of the art in contemporary compound bow design, looks great and is very smooth drawing, forgiving and generally very shootable while achieving more than adequate speed for any hunting scenario will not be disappointed with the BR33. For more information, visit bear-archery.com or call (800) 694-9494.